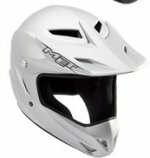 This MET Armadillo Helmet is for downhill and is the lightest one of its kind in the world! Ultimalite Fiberglass. NOVA3 process. Advanced Airflow cooling system1. 9 air intakes. Internal air channels. Ventilated chin guard. Adjustable and removable visor, including 2 air intakes. Washable pads in Coolmax. Weight: 670g.